What are the social service needs of low-income urban American Indians and to what extent to do they access Administration for Children and Families (ACF) services and supports? This book presents the results of an exploratory study to better understand Urban Indians' interactions with ACF programs and services. Data were obtained via in-depth interviews with directors of Urban Indian Centers (UICs) from around the country and a set of employees from local government social service agencies. 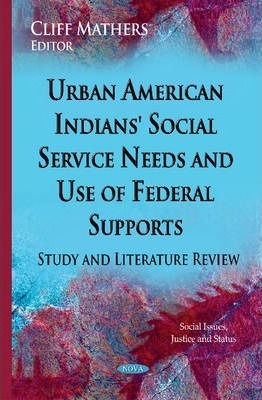 Interviewees were asked to identify the range of social service needs of the population; barriers to accessing ACF services, what role the UICs play in meeting urban American Indians' needs, and any promising or effective practices that they believed would improve services to the urban Indian population. This literature review also summarizes what is known about the status of urban American Indian/Alaska Native (AI/AN) children and families including their history of engagement with government services and the potential impact historical policies have had on current government service use. It also explores urban AI/AN families' cultural engagement and ways in which cultural identification might pose barriers or facilitate access to services provided by ACF. In addition, existing literature is examined for information about how the context in which these families live might facilitate or impede access to services. Finally, the review incorporates what is known about the current level of urban AI/AN need for and utilization of ACF-funded services. Preface; Understanding Urban Indians Interactions with ACF Programs and Services: Final Report; Understanding Urban Indians Interactions with ACF Programs and Services: Literature Review; Index.